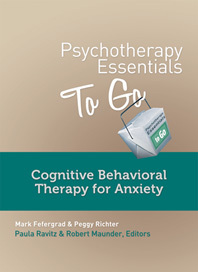 Psychotherapy Essentials to Go - Description | W. W. Norton & Company Ltd.
From fundamental skills to more detailed clinical application across a number of different anxiety disorders—including panic, social anxiety, generalized anxiety, OCD, and specific phobias—this concise guide provides a user-friendly overview of CBT for anxiety so any clinician can begin to implement it with their patients. Techniques for early, middle, and end phases of treatment are covered, including goal-setting and collaborative therapeutic engagement with clients, as well as methods for interoceptive exposure, challenging avoidance, and employing the thought record. A six-book set of quick-reference, multimedia guides to key protocols all therapists need to know. 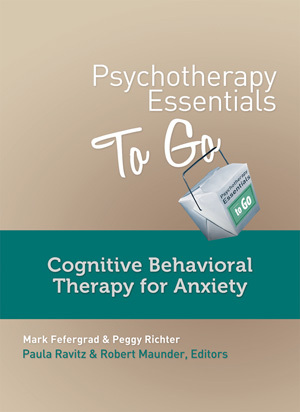 The Final book in a series of quick-reference, multimedia guides to key skills all therapists need to know.